Before the sun came up, I was awake. The roosters did a good job of that. But it didn’t matter on this day. I was heading to the Mayan city of Tikal. Our shuttle left from Hotel Mon Ami at 5:30 a.m. My French dorm-mate and I gathered our belongings and walked down a wooden staircase into the darkness of the hotel restaurant. Soon, I saw LED lights from a married Australian couple, Paul and Kate, who were also staying with us. Still groggy from the early hour, we made small talk as we waited for the shuttle to arrive. A few minutes later, a van pulled alongside the hotel. We climbed aboard and crammed into the makeshift bus. Everyone inside the vehicle was silent as we slugged along the uphill roads toward the national park. Thirty minutes later, we arrived. But the journey wasn’t over yet. After paying our entrance fee, we got back on the bus for another 20-minute ride to the beginning of the path that would take us to the ruins. The central portion of Tikal is more than six square miles. Within minutes, it was clear that we needed some direction. A park employee ran up beside us and asked if we were lost. We told him “no,” but he then told us the quickest way to get to the Great Plaza. My dorm-mate and a Seattle native who joined our group darted away. Paul, Kate and I were left to fend for ourselves. 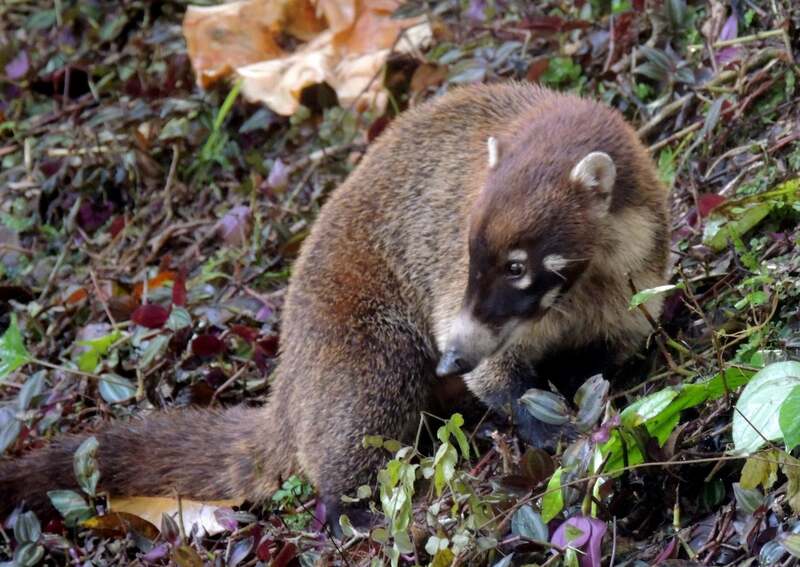 White nose coatis are all over Tikal. We watched this one open a trash can with his nose. Eventually, we reached the Great Plaza. The twin temples towered above the green grass. Looking to my right and left, I could see the temples were flanked by two acropolises. 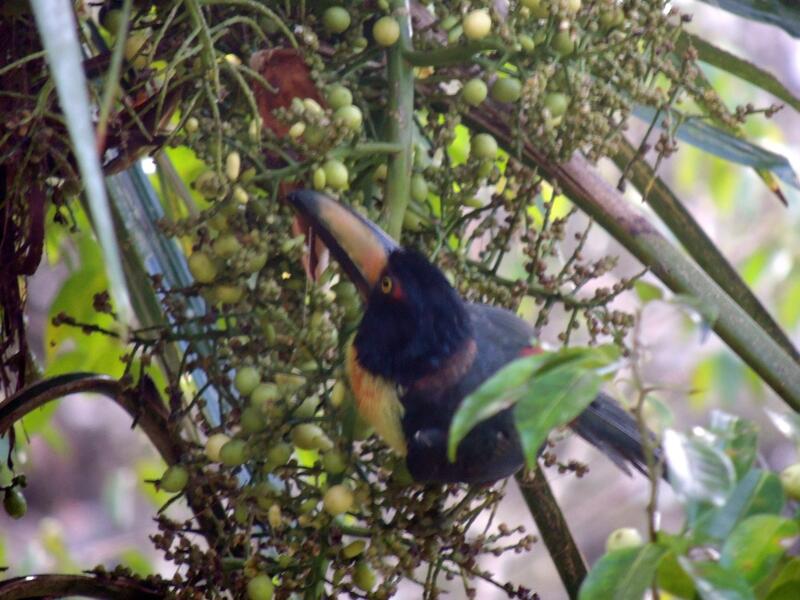 As we walked alongside Temple I, Paul pointed out three toucans in a tree. They were grabbing breakfast and provided the perfect picture opportunity. One of two toucans we saw in Tikal’s Great Plaza. That’s when uncertainty crept into Paul’s mind. “Are you sure this is the Great Plaza?” he asked Kate. She wasn’t sure, and with skepticism in our heads, we turned around in search of the real “Great Plaza.” But after seeing three “salida” signs, we realized a mistake had been made. 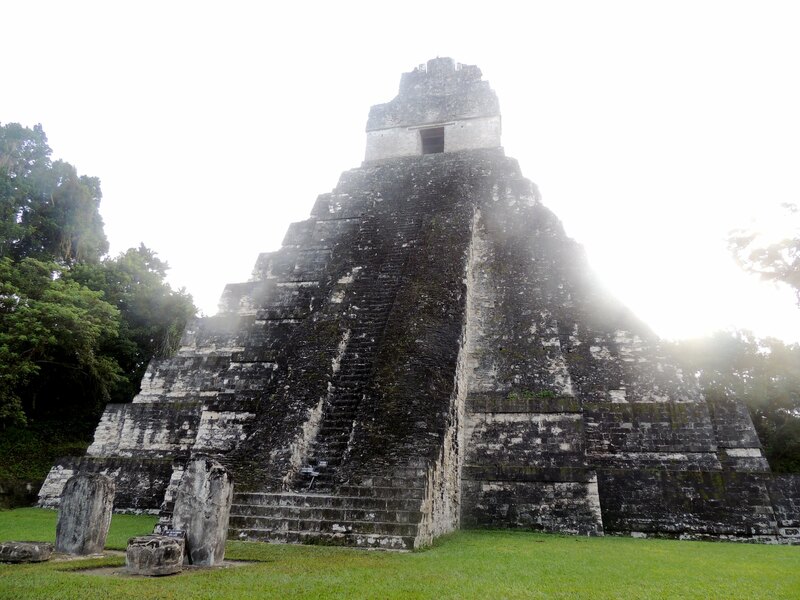 We retraced our steps through the Great Plaza and continued to Temple IV, the tallest structure at Tikal. Rising 230 feet above the jungle floor, I climbed a wooden staircase to the top. The view from the top of Temple IV. Temple III is in the foreground. Temples I and II are in the distance. The scene was serene. I could see Temples I, II and V rising above the jungle. Birds chirped songs. The awe of the place brought our group to silence. After a few minutes, Paul, Kate and I left to find El Mundo Perdido. That’s Spanish for “The Lost World.” I wasn’t impressed as much as I had been from the sights I had just seen, but Paul, who had turned into a wildlife expert, spotted a spider monkey. High above us, we saw the animal feasting on some fruit, then tossing the remains onto the ground. Several times, he almost hit Paul. I’m not sure if the monkey wanted us to leave, but he was photogenic for me. We walked further along the trail and saw Temple V. Excavations started in the ‘90s, making it one of the newest sites at Tikal. Half of the temple was exposed; the other side was covered in grass with trees growing out of the dirt. 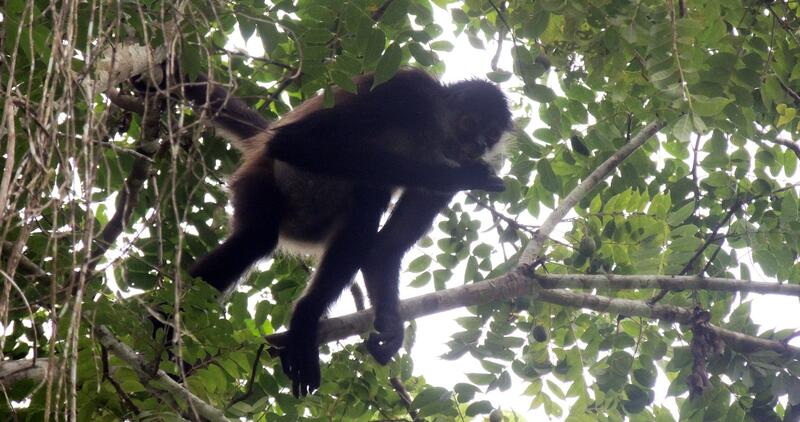 A spider monkey eats in a tree near El Mundo Perdido. Wildlife is abundant in Tikal and made the day in the park more enjoyable. Having seen most of the park, we walked back to the Great Plaza. By then, it was 11 a.m. We were ready to leave for the exit, when we heard a familiar voice. “So did we,” we said. But the one lesson I have learned while traveling is that everything manages to work itself out. We walked together toward the entrance and shared our experiences of wandering through Tikal. Once that was done, it was time to put up my feet, relax and linger in the memories of the day.